…So here’s maybe a start for the hyper-critic oath (‘hyper’ because I’m overthinking this and ‘critic’ because ‘reviewer’ doesn’t work for the pun). First, do no obvious harm. Don’t ever slander a writer. Avoid attacking them personally, even indirectly [that’s not always possible because writing is to varying degrees an extension of the self. In addition, some texts themselves are INTENDED to be harmful to others (I’ve reviewed many here over the years) BUT while we can all think of exceptions the norm should be to review texts, not people.] This does not mean treating all people the same – if you knew that somebody was currently in a vulnerable emotional state, then maybe reviewing their book isn’t a great idea. The flip side of that is you can’t reasonably tailor reviews around what a writer you don’t know might be feeling. And obviously don’t use slurs, stereotypes or language which we know to be harmful – such as overt racism, sexism etc. In an equitable society, some people are more vulnerable to others and if we KNOW that we have to be mindful of that while bearing in mind the points below as well. (2) TO THE TUNE OF CORALINE. 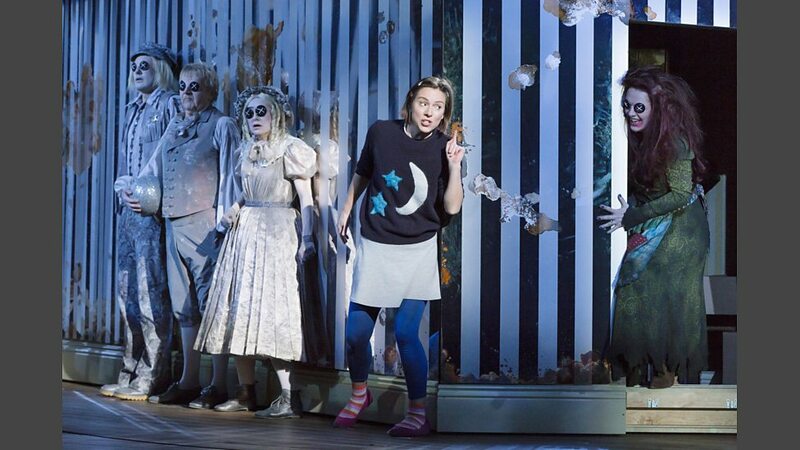 The opera based on Neil Gaiman’s Coraline is available on the BBC iPlayer for the next 29 days: “Mark-Anthony Turnage: Coraline”. Kate Molleson presents the world premiere production of Mark-Anthony Turnage’s Coraline – an operatic version of the dark fantasy tale by Neil Gaiman, directed by Aletta Collins with libretto by Rory Mullarkey. Soprano Mary Bevan sings the title-role with a cast including mezzo-soprano Kitty Whately and baritone Alexander Robin Baker who are making their Royal Opera debuts. Sian Edwards conducts the Britten Sinfonia. During the interval, Kate is joined by guest Fiona Maddocks with contributions from Mark-Anthony Turnage and Mary Bevan. (3) FANTASTIC HOW MANY? A trailer advertising the Fantastic 4’s return to comics in August. But Carl Slaughter says, “Wait a minute. Maybe I missed someone, but I saw only 3 members of the Fantastic 4 at the end of that teaser….” Actually, Carl, couldn’t that pillar of fire in the closing image be your missing fourth character? (4) TRACK RECORD. A member of the Universal Fan Con committee – a con cancelled at the last minute — is alleged to have a problemactic past. (5) SPOILER ALERT. Commentary on a recent Red Dwarf-themed word puzzle: “Inquisitor 1533: A Little Light Relief by Eclogue”. The full message is IT’S COLD OUTSIDE THERE’S NO KIND OF ATMOSPHERE which are the opening lyrics to the show’s theme song. The wording of the preamble was very precise when it stated ‘the correct letters from misprints in definitions provide the opening to the theme’. I could see then that the unclued entries were going to be the characters from the show. It was the one I didn’t really know that fell first – KOCHANSKI – followed by HOLLY, LISTER, RIMMER, KRYTEN and CAT. CAT came last because I nearly missed it. (6) IT’S HUGE! In “Kickstarter Final Note”, Steve Davidson shares a bit of news about Amazing Stories’ next first print issue. … One genre defined by the struggle to create living settings in science fiction is Hard SF. ‘An emphasis on scientific or technical detail’ is a sure-fire way to create a realistic and functional universe, but often the need to adhere to realism slows creativity, stresses the narration, leads to improbable results or otherwise has negative effects. One of the biggest complaints is that it just isn’t ‘fun’…. Space Piracy is a common science fiction trope. It has been continuously derided in Hard Science Fiction as silly and a holdover of the ‘Space is an Ocean’ analogy. But is it really that unrealistic to have space pirates? Let’s find out. There’s more to piracy than just attacking a target and running away afterwards. Put yourself in the shoes of a pirate, a merchant or the authorities. What would you do? (8) BUNCH OF LUNCH. Why aren’t there more big mammals? We ate them. “New Study Says Ancient Humans Hunted Big Mammals To Extinction”. That’s the conclusion of a new study of the fossil record by paleo-biologist Felisa Smith of the University of New Mexico. Smith studied fossils going back 65 million years, when dinosaurs died and mammals came into their own. Many of the early mammals went on to get big. Among the giant creatures: “Llamas and camels and sloths and five species of pronghorn [antelope] actually,” she says, “and certainly mammoths. And then lots of really cool predators, like Arctodus, the short faced bear.” The short-faced bear stood 11 feet tall, about the shoulder height of some species of ancient camel. Being big was just as successful as being small, and had some advantages when it came to surviving big predators. “Taken as a whole, over 65 million years, being large did not increase mammals’ extinction risk. But it did when humans were involved,” Smith found. April 21, 1997 — Ashes of Gene Roddenberry journeyed into space. John King Tarpinian shared this link with pun lovers in mind — Off the Mark. (11) BRADBURY MUSEUM UPDATE. A proponent told the Chicago Tribune —“Ray Bradbury Experience Museum planning start in smaller space, eventual move to old Carnegie Library”. Instead, early next month, plans will be unveiled for a more modest Ray Bradbury Experience Museum (RBEM) with a goal of opening in a Genesee Street storefront in time for the 100th anniversary of the late author’s birthday in August 2020…. (12) WOTF. Kyle Aisteach posted a memoir about “My Writers of the Future Experience” in the 1990s. Aisteach was a paid add-on student of the workshop, not a contest finalist. … The workshop itself was much like what others have described: A whirlwind of big names coming in to talk to us, intensely trying to churn out a complete short story in just a few days, a lot of theory, and a lot of making friends. I learned a tremendous amount, much of which I carry with me and still use to this day. The workshop was wonderful. But the question everyone wants to ask is this: What about the Scientology? Well, it was definitely there. The impression I had at the time was that L. Ron Hubbard founded Scientology and therefore Scientology loves L. Ron Hubbard and everything he was associated with, and therefore the Church of Scientology wanted to support us in any way it could. David Miscavige was there to welcome us all. L. Ron Hubbard’s name was not just mentioned frequently, it was extolled. We were clearly and obviously using Scientology property for both the workshop and the gala. I, personally, found it a little uncomfortable at times, but I’m always uncomfortable in someone else’s sacred space, so there was nothing weird about that to me. A couple of the texts we used were clearly Scientologist documents (the biography of Hubbard had him transcending instead of dying, and another essay – I don’t recall exactly what it was about – Budrys explained was written for Scientologists and he explained what terms like “clear” meant so we could follow it), but that didn’t faze me either, since texts that inform writing can come from anywhere and most of us pull from our own traditions when teaching. Before anyone has a meltdown about any of this, remember that this was the 1990s. Scientology had some legal troubles as a young religion, but at this point the general feeling was that it had left them behind…. And former Writers of the Future winner J. W. Alden has written another thread – start here. Guess where the text of this WOTF handout came from? (13) BEWARE EVENTBRITE. Slashdot warns “Eventbrite Claims The Right To Film Your Events — And Keep the Copyright”. And despite how much there is to be angry about, How to Suppress Women’s Writing is shot through with hope. There’s the energy of a secret shared in “the rocking and cracking of the book as the inadequate form strains or even collapses.” And beneath every denial of agency, there’s the obvious truth: For hundreds of years, despite those odds against them, the “wrong” writers still manage to write. Likely it won’t be remembered long enough or taken seriously enough, but to read this book is to admire this buried tradition, and realize how much there is to be discovered — and how there’s no time like the present to look at the marginalized writers you might be missing. “Only on the margins does growth occur,” Russ promises, like the guide in a story telling you how to defeat the dragon. Get angry; then get a reading list. (15) MOVERS AND SHAKERS. In California, they’re “Betting On Artificial Intelligence To Guide Earthquake Response”. (16) HAPPY BIRTHDAY HUBBLE. Great photo: “It’s The Hubble Space Telescope’s Birthday. Enjoy Amazing Images Of The Lagoon Nebula”. Hubble was launched on April 24, 1990, aboard the space shuttle Discovery as a joint project between NASA and the ESA. Each year, the telescope is diverted from important scientific observational duties to take an image of the cosmos in intense detail. This year’s featured image, the Lagoon Nebula, is a colossal stellar nursery, 55 light-years wide and 20 light-years tall, that is about 4,000 light-years away from Earth. (17) END GAME. Looper tries to explain the ending of Ready Player One. Watch out for spoilers, I assume!